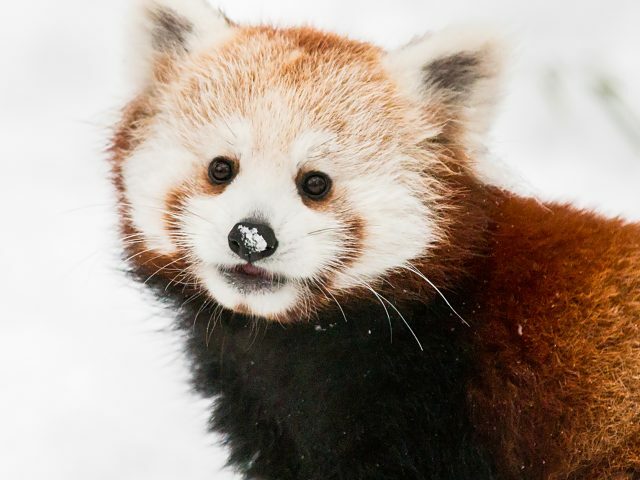 The red panda has a soft and dense coat with a thick under-fur. Their face is light with dark markings, and rusty red stripes beneath each eye, similar to the markings of a raccoon. They have large, upright ears with a white spot on the inside. 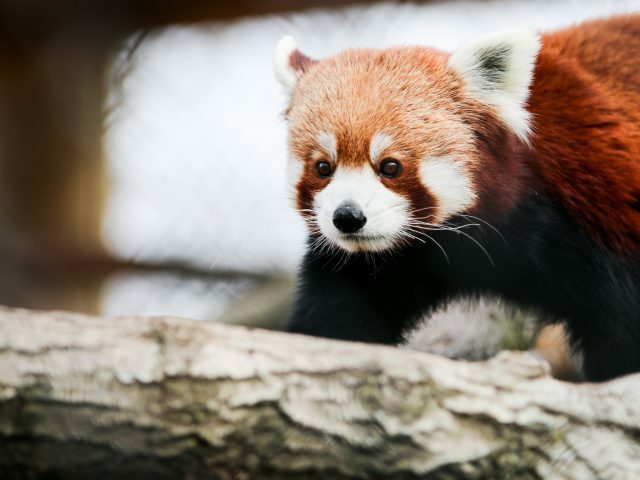 Red pandas have a long, bushy, reddish-brown tail with pale reddish rings which they use to cover their face and keep their noses warm in the cold. 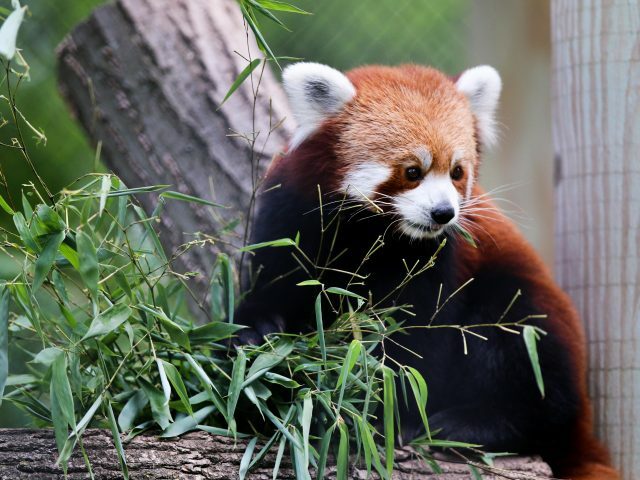 Red pandas are crepuscular, which means they are active mostly at dawn and dusk. Most of the day is spent by resting and sleeping in trees. 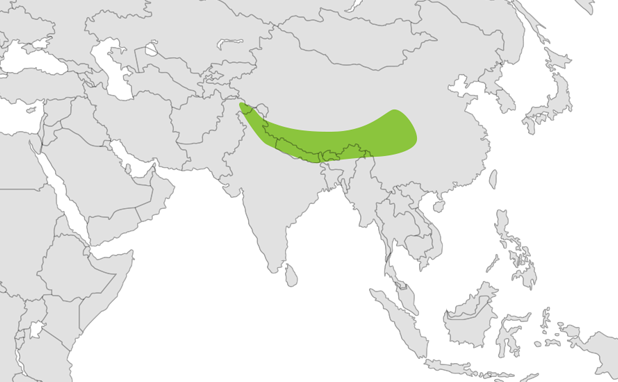 Territories are marked with substances from their footpads, and males fiercely defend their territory. 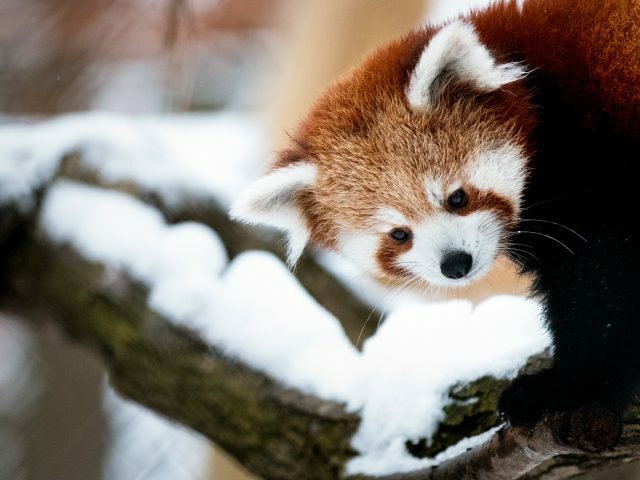 Red pandas are agile climbers, and they use their long tail for support and counterbalance as they tend to sleep with legs straddling a branch, or tightly curled up with head under a hind leg. They eat sitting, standing, or (only a few other animals can do this) lying on their back. 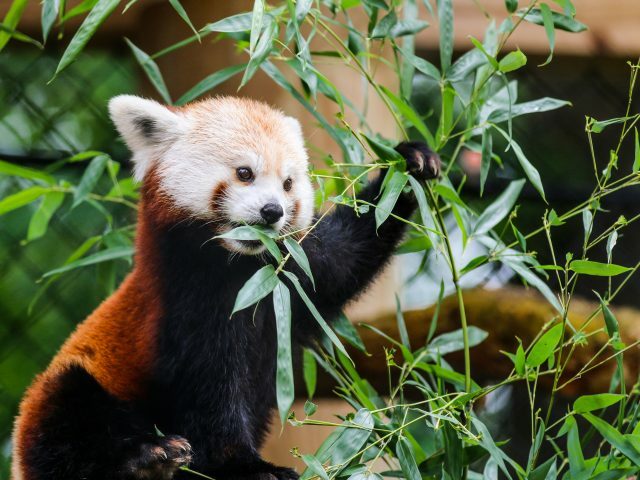 A bone on the inner side of their wrist acts as a “false thumb,” and helps them handle bamboo leaves and poles. Classified as a carnivore, it does not get much nutrition from vegetation, requiring a significant portion of the day to be spent feeding. 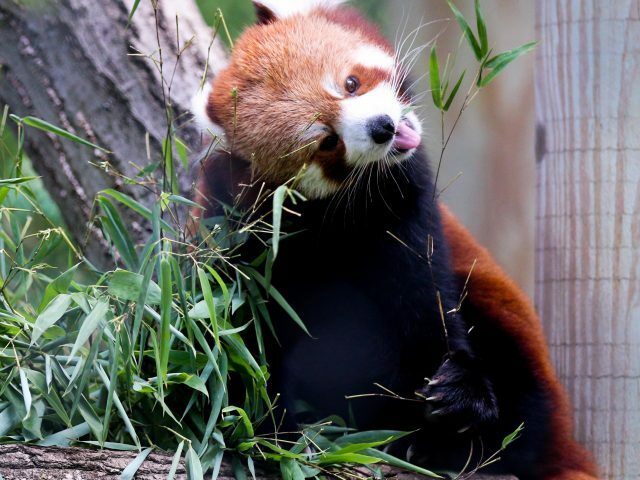 Red pandas eat sitting, standing, or (only a few other animals can do this) lying on their back. 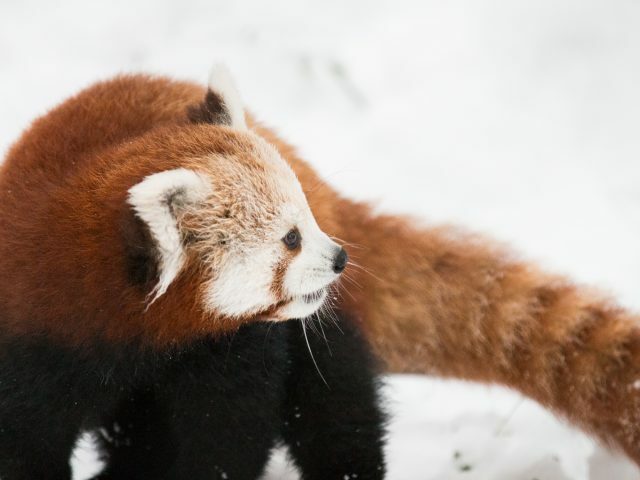 We have two red pandas at Potter Park Zoo. Rupert Jr. was born at the Detroit Zoo in 2011 and Maliha was born at Fort Worth Children’s Zoo in 2014. In 2016, the pair gave birth to a male and female cub who now live at Capron Zoo in Massachusetts. 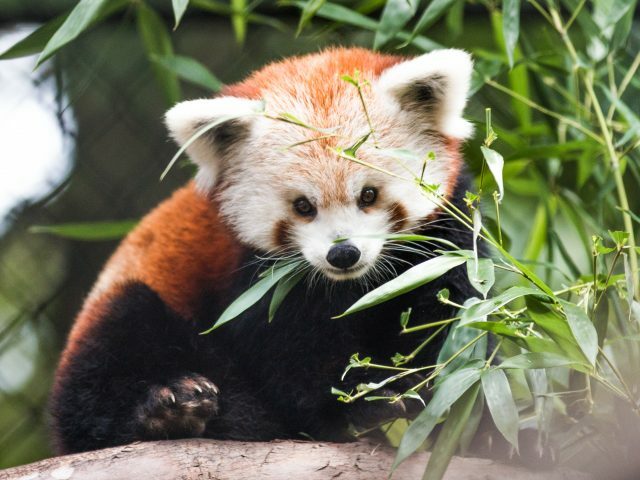 Red pandas are small, with an overall length of 3 to 3.5 feet, and they weight in around 10-12 pounds. 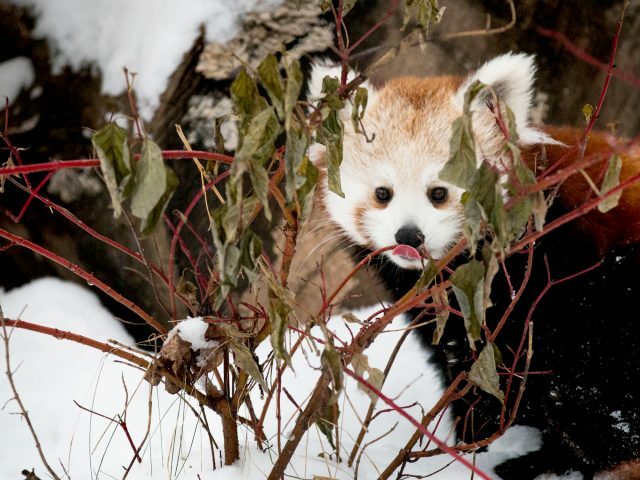 The red panda eats mostly bamboo, with some berries, mushrooms, grasses, and bark. It will also eat birds, eggs, insects, and small rodents.